Ahhh, I've been thinking about this Pretty Fall Princess challenge since I saw it on Tiddly Inks Challenge 2 weeks ago and FINALLY got around to doing it today! I created my scene by combining two images from Tiddly Inks in PSE. I used Gothic Window and Fairy Fae Dreams - They worked SO well together! When I saw this week's sketch at 2S4Y I knew it would be perfect for my little scene. Carisa - I love this card....what a great combo of Tiddly images! Hey, your coloring looks fabulous too! I am in awe of you ladies that not only colour your images, but using the computer to play around with your images. Flawless combination! 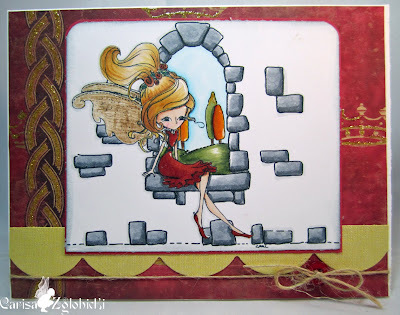 Just love it (fairy tale scenes are close to my heart)... Congrats on winning the Ippity Guest Designer of the Day!!! I love the way you put the fairy in the window! Great card! So glad you could join us at Tiddly Inks this week!